Phantoms players and officials line up with the NIHL South Cup. Ferrara hit the clinching goal as Phantoms saw off Basingstoke 6-5 on aggregate to capture the NIHL South Cup last Wednesday night. 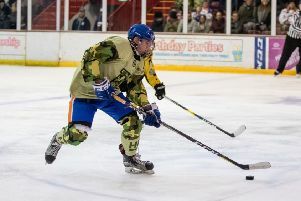 It was a success which completed an honours double following NIHL Autumn Cup glory earlier in the campaign, but Phantoms are still hungry for more glory as the NIHL Division One South play-offs begin this weekend. The second-placed city side take on second-bottom Milton Keynes Thunder in a first-round clash. The sides meet in Buckinghamshire on Saturday (7pm) ahead of a Sunday return at Planet Ice (5.30pm). “I’m immensely proud of everyone involved in the club,” said Ferrara. “It felt great to score the cup-winning goal, but lifting the trophy is what really meant so much to me. “A lot of guys scored a lot of important goals in the final and throughout the cup run - and every one of them was important. “Basingstoke are a good team who kept coming at us. They showed their character by continuously getting the lead after losing the first leg, but we then showed our courage to get back level on the night. “We know we have people with the ability to produce a piece of magic and win us any battle that we’re in - and that stands us in really good stead for the play-offs. “There is still more silverware up for grabs and our ambitions for the season didn’t stop last Wednesday night. “We have already proven that we can get the job done in the big games and we’d love to add more silverware if we can. “The two cup wins and another good season in the league give us huge momentum going into the play-offs. 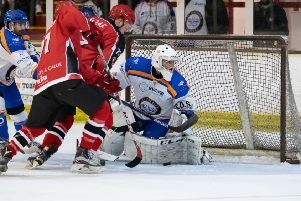 Phantoms boasted two of the three leading goalscorers in the NIHL Division One South regular season. Czech star Ales Padelek topped the charts after finding the net 34 times while fellow import Petr Stepanek finished third with 31 goals. Captain James Ferrara (66) and Padelek (63) finished second and third respectively in the total points list as well. Phantoms have confirmed their participation in the new National League for next season. They are one of 10 teams in the new second tier of the sport. Fellow Division One South sides Swindon, Basingstoke, Bracknell and Raiders will also step up along with Division One North top three Hull, Sheffield and Telford. Milton Keynes Lightning, who drop down from the Elite League, and new club Leeds complete the line-up.